I swear I mean to post more taggish memes (even the ones that I wasn’t tagged in but find interesting), but I always seem to want to push them off at later dates up until I forget about them. Oops? In my defense, I’m not so late with this one! 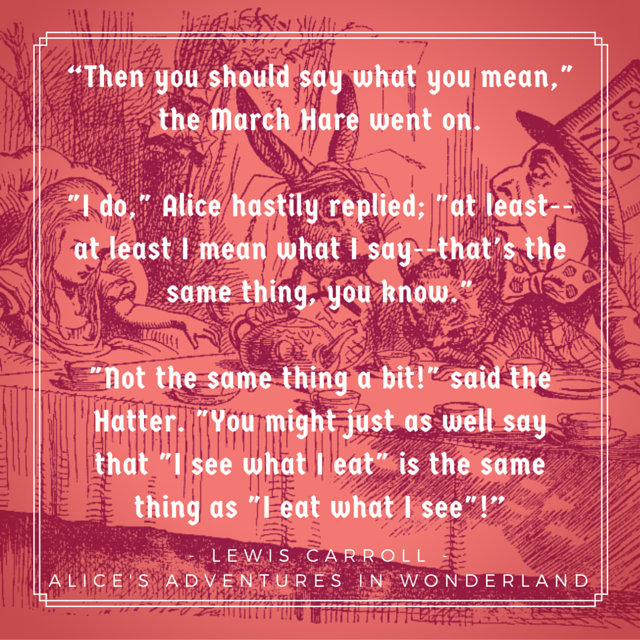 The book is absolutely quotable from top to bottom, though my favorite sayings have always been when the Mad Hatter engages Alice in a bit of wordplay. There’s something reminiscent of mathematical logic in this particular quote (which makes sense, considering the author was very proficient in mathematics), and for me, it’s still one of the best literary-rendered explanations of conditionals that I’ve ever seen. I mean what I say. I love Alice in Wonderland (hehe). Haha. I couldnt help it! It was so appropriate.